A while back, Culinary Fool asked me if I’d be interested in joining her cooking club. I’ve never belonged to a cooking group but the idea has always appealed to me, so I was excited about the opportunity. The chosen theme was New Orleans and I was in charge of dessert. I had been dying for an excuse to make the bread pudding that my uncle made at Thanksgiving. The sauce has bourbon in it, so I figured that gave it some New Orleans flair. The night started off with Ramos Gin Fizzes and Crawfish Profiteroles with Citrus Butter Sauce. The drink was very unusual, but also very good. It was frothy and thick, like whipped milk, but also light at the same time. 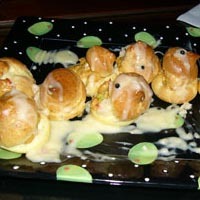 The profiteroles were perfect—I hate it when profiteroles get stale and chewy, but these were tender and delicate. The crawfish filling and citrus sauce were pungent and wonderful. Our first course was a “New Orleans-style Italian Salad”. It was an unusual salad with lots of crazy pickled ingredients, but it was good and oddly refreshing. The main course was Pan-Sautéed Catfish with Cajun Crawfish Butter and it blew me away. The catfish was perfectly cooked with a light, yet crisp crust and the crawfish butter was to die for. I could have eaten it like a soup, except that it was ridiculously rich. The accompanying side dishes were Dirty Rice and Maquechoux, which was a really great corn salad. By the time we finished dinner, I was so full that I didn’t think I could eat anymore… but bread pudding called. I had made the bread puddings ahead of time in individual ramekins, so all I had to do was warm them in the oven and prepare the bourbon sauce. I really liked the puddings, but I think I added a bit too much bourbon—or I didn’t let the alcohol cook off enough. It was a great evening and all the cooking club members were hilarious. They had some great stories and I can’t recall laughing that hard in recent memory. And I can’t wait for the next cooking club, which is going to be Greek themed! 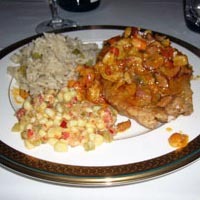 I am interested in finding a local cooking club in nola. Please send me any information you have.